How VIOLET GREY’s director of production learned firsthand that you should give the skin on your scalp just as much love as your complexion. I have tried everything to heal my scalp. Truly—everything. When I was a kid, I cycled through a seemingly endless list of dermatologist-prescribed treatments with ingredients ranging from typical (pyrithione zinc, tea tree oil, selenium sulfide) to downright gross (coal tar). I’m pretty sure I tried every single over-the-counter scalp shampoo on the market, plus a number of prescriptions. When that didn’t work, a naturopathic doctor told me to coat my head with olive oil, wrap my hair in shrink wrap, and let it soak in for a few hours before rubbing my scalp clean. This worked for a few days. My strands were greasy for a few weeks. It was insanely embarrassing for a shy 12-year-old. You’re probably wondering why anyone would subject a child to this grab bag of bizarre topical remedies, but in truth, I was always first in line to volunteer, and still am. I have had chronic seborrheic dermatitis (basically a severe case of dandruff meets eczema; read: itchy, red, flaky, inflamed scalp) for as long as I can remember, and I am willing to try pretty much anything to combat it. I have found a number of treatments that work for me, but they usually come with frustrating drawbacks: dry hair, a funky lingering scent, financially unsustainable costs, and the list goes on. To make matters more complicated, I’ve conducted many of my trials in the dark. Dermatologists still don’t know much about the underlying causes of seborrheic dermatitis and other scalp conditions. Plus, with hair as a built-in cover-up, it’s often easy to conceal scalp issues. My colleagues were completely surprised when I asked to write about my own scalp saga—they had no idea I’ve been hiding flaky red patches under my locks. We put so much emphasis on cleansing, toning, moisturizing, and treating our complexions, but we generally don’t speak openly about the fact the scalp is essentially an extension of our face. Lucky for me, I work at VIOLET GREY. As you know, we take curation very seriously, and are passionate about finding the best products for every part of the face and body. I am incredibly pleased to introduce you to one of those offerings, this time for your scalp. Meet Leonor Greyl Huile Apaisante. 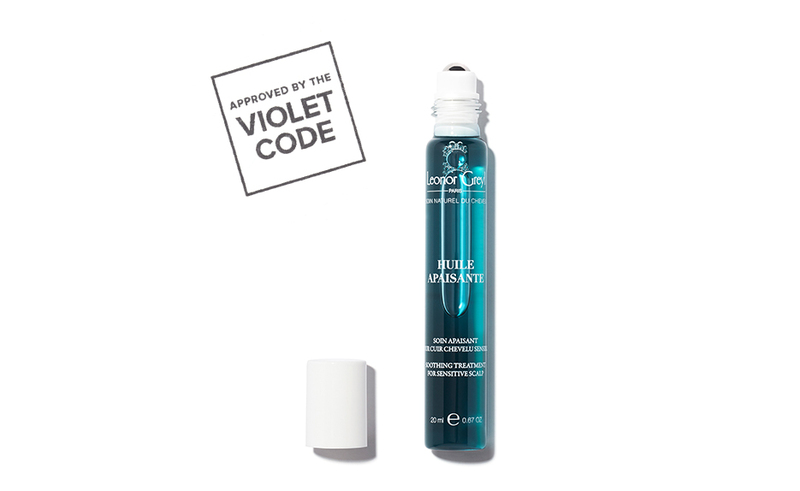 The cult-favorite hair care collection recently revealed this treatment as a direct response to the scalp stressors of modern life. “At a time when lifestyles are busier than ever, scalps are becoming increasingly sensitive. Stress, pollution, poorly rinsed shampoo, styling products that leave a residue—all these factors contribute to redness and irritation,” explains Caroline Greyl. 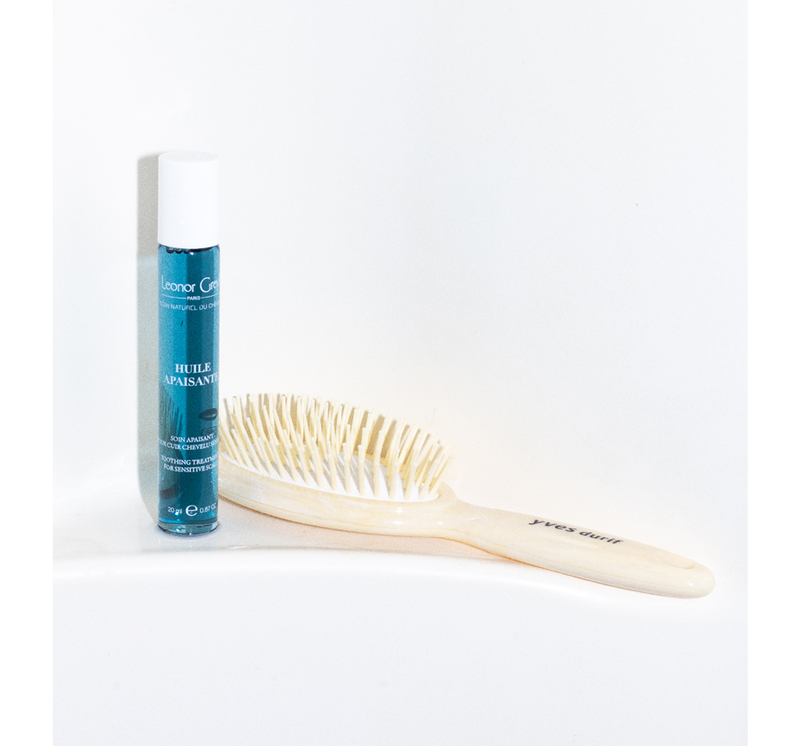 Huile Apaisante combines powerhouse anti-inflammatory ingredients like copaiba oil and azulene to soothe and purify the scalp, rebalance sebum production, and repair the skin’s hydrolipidic film. A rollerball design allows for an effortless targeted application. Simply part your hair and roll across the area you want to treat. The metal ball is cooling and soothing, and even a thin layer of product provides immediate relief to irritated skin. The whole process is super relaxing and meditative. For those like me with flaky scales, the oil helps loosen patches for easier deep cleansing in the shower. I like to apply it as a pre-shampoo treatment, followed by a purifying salt scrub to thoroughly cleanse and unclog my pores. One of my favorite aspects of this product is that it doesn’t contain any irritating essential oils or fragrance. With some of the more efficacious scalp treatments leaving behind lingering smells of sulfur in my hair all day (seriously), it’s refreshing to use an effective product without a scent. The sleek, slim bottle fits easily in your purse, so you can bring it with you wherever you go. The oil also works great as a protective shield against the chemicals in color treatments. If you have a sensitive scalp, I highly recommend rolling it across your entire head before coloring your hair. A final perk: Unlike most scalp products, it looks chic in your bathroom (I won’t name names, but you know how the “knees and toes” song goes). While I tend to shyly stash my anti-dandruff shampoos, I keep my Huile Apaisante proudly on display, hoping guests will ask me what that pretty blue glass bottle is and if they should try it.